Funicular to Petřín Hill and chairlift at the Prague ZOO. 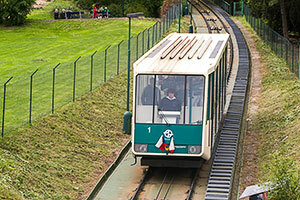 The funicular to the top of Petřín Hill starts at the Újezd tram stop (trams 9, 12, 15, 20, 22, 23) in Malá Strana and runs daily from 9 a.m. to 11:30 p.m. (11:20 p.m. from November to March) in 10-15 min. intervals. To take the funicular, use the same public transport ticket as you would on trams or the metro (see Tickets & Passes). The chairlift at the Prague ZOO runs from the end of March until the end of December, daily from May through September, daily except Tuesdays in April and October, and on some days of the week in the remaining months. One ride costs 25 Kč. Tickets are sold in ticket machines at both ends of the line. You can look up the Petřín funicular schedules at dpp.cz. The names of the stops are 'Ujezd LD' (bottom of the hill) and 'Petrin LD' (top of the hill).